In woo-woo terms, reciprocity is an exchange of mutual benefit. In potspeak, reciprocity means people from California and 26 other states and the District of Columbia can easily obtain and use medical cannabis in Nevada. At least for now. While dispensaries and the state attorney general haggle over the exact documentation California residents must provide, Nevada offers reciprocity to qualified medical cannabis patients from any state where medical cannabis is legal. Medical cannabis users no longer need to transport their stash across state lines. They can buy it Nevada. Nevada is the only state in America to offer such reciprocity. The program, authorized in the state’s 2014 medical cannabis law, launched when Nevada’s first dispensary opened in July 2015. Six other states offer a limited form: protection of the law to possess but not purchase. Graber said internal monthly reports of dispensary sales show out-of-state customers, primarily from California, can account for up to 50 percent of some Las Vegas dispensaries’ business. In Reno, Graber said, it’s about 10 or 15 percent. Reciprocity, however, comes with a catch for Californians and others. Responding to a proliferation of cannabis tour companies providing California clients online medical cannabis recommendations from inside Las Vegas limousines, Nevada Attorney General Adam Laxalt issued an opinion this summer: Dispensaries can only accept government-issued medical cannabis cards. That’s no issue for medical cannabis patients in most medical cannabis jurisdictions, where government-issued medical cannabis cards are mandatory to obtain and use medical cannabis. But it’s an issue for people from California, Maine, Maryland and Washington because enrollment in these states’ medical cannabis identification card programs is voluntary. In California, most people enter dispensaries with letters or cards printed at doctors’ offices. According to the California Department of Public Health, 6,667 California Medical Marijuana Identification Cards were issued in fiscal year 2015-2016. The Marijuana Policy Project estimates there are 758,000 medical cannabis consumers in California, or 19.4 percent of the state’s 39 million population. That question has been thrown back to the Nevada Legislature, which convenes in February. “The Department of Health said, ‘We will accept recommendations for now.’ But that could change,” said NuLeaf Incline Village’s Scislowicz, who said he forecasts a surge in California clientele this ski season. Until the Nevada Legislature sorts it out or until a critical mass of Californians get state-issued medical cannabis cards, Nevada dispensaries will ask Californians for the same documents they are accustomed to presenting at California dispensaries — original letters or verifiable cards from their doctors, plus valid government-issued photo ID. “As long as they have original paperwork from their doctor where I can feel the embossed state seal and their identification matches, that’s all I need to let them in,” said Macfarlane of Sierra Wellness Connection. In Nevada and most other medical cannabis states, state-issued cannabis cards cost $100. In California, prices vary by county — from $70 in Del Norte to $279 in Mariposa. While possession and use of cannabis is recreationally legal as of Jan. 1, retail sales will not begin until at least this summer. Retail sales will be taxed at 15 percent versus 2 percent for medical cannabis, prompting some in the industry to predict that some customers may continue buying medical rather than retail. 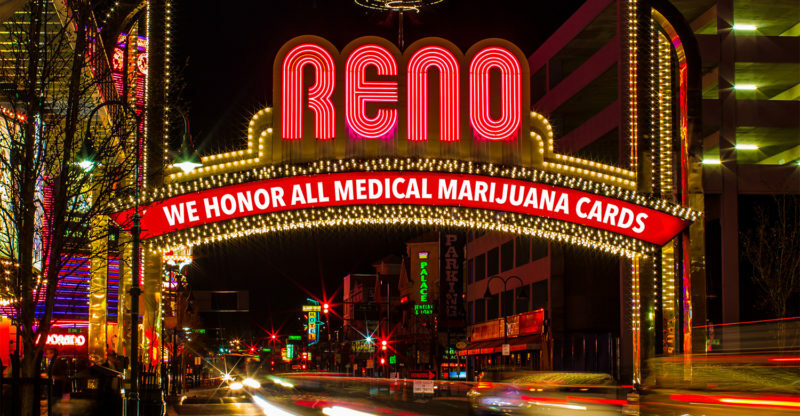 Reciprocity and the out-of-state consumers it brings is one reason Scott Dunseath and his partners in Mynt, a dispensary that will open Feb. 15, purchased land and a building in downtown Reno directly across from Harrah’s hotel and casino and a short fly ball away from the Reno Aces Triple-A baseball stadium. Ed Murrieta is a Northern California journalist. A unique program authorized by Nevada’s 2014 medical cannabis law allowing qualified patients from any legal medical cannabis state to purchase and use medical cannabis in Nevada. In Arizona, Delaware, Maine, Michigan, New Hampshire and Rhode Island, reciprocity programs provide legal protections for out-of-state patients to possess medical cannabis according to the limits of their home states but do not allow access to dispensaries. Visitors from California, Maine, Maryland and Washington may provide a valid doctor’s recommendation to use medical cannabis; and valid government-issued photo identification — just like they do at their home-state dispensaries until the Nevada Legislature rules otherwise. Alternatively, Californians can obtain and present a California Medical Marijuana Identification Card and valid identification. State ID cards are available through county health departments to people with valid doctors’ recommendations. Cards are valid for one year and vary in price by county ($70 in Del Norte, $120 in San Francisco, $153 in Los Angeles, $230 in Ventura and $279 in Mariposa). People from other medical cannabis states and the District of Columbia must present government-issued medical cannabis cards and government-issued ID. Flowers, concentrates, edibles and topicals. All flowers grown indoors mostly in Las Vegas but you’ll find Reno-grown. High desert weather, budtenders say, tends to dry flowers. Grams average $13 top-shelf, $10 mid-shelf and $6 bottom shelf. Concentrates $40-$50 per half gram. Brands like Moxie, Bhang and Kiva will be familiar to Californians. Nevada brands to watch for: Kynd and Evergreen Organic. Out-of-state patients are allowed to purchase 2.5 ounces of usable cannabis (flowers, or a determined equivalent of edibles and concentrates) every 14 days. Purchases are tracked in a state database. Visiting multiple dispensaries? Each one can tell you how much remaining cannabis you’re eligible to purchase. Consumption of medical cannabis in Nevada is legal only in private residences. Nothing. Interstate transportation of cannabis is a federal crime — one reason Nevada instituted reciprocity. Headed to Tahoe but not crossing the state line into Nevada? Your medical cannabis options are limited. Tahoe Wellness in South Lake Tahoe is the only dispensary on the California side of the Tahoe Basin. Bonus: Tahoe Wellness has an on-premises consumption lounge. Delivery services operate from Truckee to Kings Beach on the lake’s western shore. Traveling Highway 50? Highlands Wellness in El Dorado Hills is the last dispensary before you leave the greater Sacramento region. Traveling Interstate 80? Sacramento’s River City Phoenix is freeway convenient. Is Snoop Dogg the Pied Piper of weed?